Jose Mourinho was involved in a furious touchline bust-up after Ross Barkley struck a last-gasp equaliser to hand Chelsea a 2-2 draw against Manchester United at Stamford Bridge. Mourinho appeared on course to record a first victory as United boss at his old club thanks to Anthony Martial, the Frenchman’s brace overturning a half-time deficit. Martial volleyed home to cancel out Antonio Rudiger’s 21st-minute header before curling in what looked like being the winner from the edge of the penalty area. 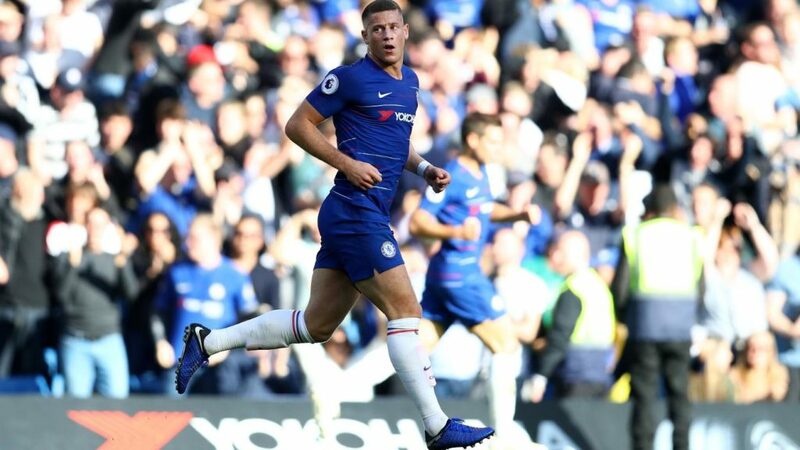 However, substitute Barkley – a major injury doubt for the fixture – made sure Maurizio Sarri avoided his first league defeat as Chelsea boss by smashing home a rebound in the sixth and final minute of additional time. The dramatic finish sparked wild scenes of celebration on and off the field, with Mourinho taking exception to one member of Sarri’s staff celebrating right in front of him. Security staff had to get involved to restore order, though the two managers shook hands after an eventful conclusion. An early kick-off in late October sunshine, combined with a return to domestic duties after an international break, perhaps unsurprisingly led to a slow start before the game’s opening goal in the 21st minute. Rudiger gave Paul Pogba the slip to meet Willian’s outswinging corner from the right, planting the ball low beyond visiting goalkeeper David de Gea for his first goal of 2018. However, Mourinho’s half-time words seemingly transformed United. With the defensive shackles removed after barely venturing out of their own half before the break, they struck twice in an 18-minute spell to take the lead. Martial capitalised on a slice of good fortune – Ashley Young’s shot taking two deflections to break into his path – to fire in an equaliser, while a heavy touch inadvertently set him up to bend an effort beyond Cesar Azpilicueta’s attempted block and put Mourinho on course for a famous triumph. Yet the Portuguese was denied on his old stomping ground right at the death. David Luiz headed Pedro’s cross against the post and Rudiger hit the rebound straight at De Gea, though it turned out to be third time lucky for the Blues when Barkley hammered his attempt into the net.